Myanmar’s Protracted Civil War: Drawn-Out Peace Or Battle Lines Drawn? Myanmar passed an historic milestone on 15 October, signing into effect what its government terms to be a “Nationwide Ceasefire Accord” (NCA) between itself and eight ethnically centered rebel organizations. As positive of a step as this may notionally be towards resolving the world’s longest-running civil war, it’s substantially without a solid backbone, as at least seven of the country’s strongest rebel formations followed opposition leader Aung San Suu Kyi’sadvice in taking their time and refusing to sign. With the nationwide elections just under one month away, it’s obvious that the NCA will become the most polarizing electioneering tool for both the government and the opposition, with each side evoking the agreement as a means of further ingratiating themselves with their respective bases, both majority Burmese and ethnically affiliated. Whether the NCA leads to a drawn-out peace and eventual settlement or has contrarily drawn the new battle lines for an upcoming explosion of civil war depends entirely on the results of the election and the reaction of both sides, but from the looks of things, it appears as though Myanmar is in for a very rocky and polarized future. Part I begins by expounding upon the details of the NCA and the military and political factors that guided each side’s position relative to the agreement. Afterwards, it examines the intricacies of the strategic geography present in the country after the NCA’s signing and analyzes the inherent incompatibility of both blocs’ nationwide objectives. Finally, the last two sections wrap everything up by forecasting the three most likely scenarios to result from these conflicting national contrarieties, eventually concluding that there’s a disturbingly real risk that India and China might get sucked into the conflagration and enter into a destabilizing proxy war against the other. On paper at least, the NCA is an historic document for Myanmar, and the attendance of representatives from China, India, Japan, and Thailand to oversee its signing testifies to the international optimism that key players have about its significance. Each of the groups that are party to the agreement are removed from the government’s list of illegal organizations and are now allowed to enter mainstream politics, importantly just in time to participate in the upcoming elections. The next step of the process takes place at the end of November, 40 days from the ceasefire’s signing, by which all sides must agree to a code of conduct and a joint monitoring committee. The most important determinant over whether a group signed the NCA or not appears to its military strength, as the weaker groups aligned with the government while the more powerful ones refused to budge. For example, the Kachin Independence Organization (KIO) and United Wa State Army are the strongest insurgent groups in the country, while the All-Burma Students’ Democratic Front is scarcely a force and the hodgepodge of Karen militants have been weakened by in-fighting over the years. The situation with the National Socialist Council of Nagaland – Khaplang (NSCN-K) is a bit different, in the sense that the government may not have wanted to be seen as fully accommodating a group that the Indian government recognizes as a terrorist organization, which might explain why it didn’t bend over backwards to get it to sign. Additionally, the NSCN-K, while likely having its own interests in possibly agreeing to the NCA, is also tightly connected to the KIO that flat-out refused to sign the accord, so in a tactical sense, it was much more advantageous for it to stay outside of the agreement anyhow. That being said, this decision is forecast to have a strong impact on future events, and the analysis will return to it in a forthcoming section. Each of the rebel groups would like to increase their respective ethnicity’s share of power in the country, feeling that they’ve been left out of the economic and political loop for far too long. The difference over ends, however, comes down to which side they’ve now aligned themselves with, which as was just explained, is primarily due to whether the said group was strong enough to resist the government or not. Those that are now associated with the authorities through their cooperation in the NCA are in support of retaining Myanmar’s unitary nature, as Naypyidaw does not seem willing to flip-flop anytime soon on its decades-long stance of anti-federalization. Given that the nominally civilian-led (but heavily military-influenced) administration is “reforming” the country, it’s conceivable that it might allow some degree of autonomy for minority-majority areas if it absolutely has to, but it would definitely fall short of the federalist structure that the NLD opposition and its allies would like to see enter into practice. That’s the primary and irreconcilable difference between the two sides, as the government is adamant in preserving the unitary state, while the opposition wants to dismember it into largely independent and resource-rich ‘ethnic reserves’. In fact, out of the 11 groups that constitute the United Nationalities Federal Council, a pan-rebel alliance of pro-federalist entities, only three of them (the Karen National Union, Chin National Front, and Pa-O National Liberation Organization) ‘defected’ to the government by signing the NCA, with the remaining eight unyielding in their pursuit of Suu Kyi’s federalist agenda. As mentioned above, it’s the weaker groups that ‘crossed the aisle’, so to speak, so the central government simply gained symbolic allies while the federalists still retained the lion’s share of their strength. The non-signatories can thus leverage their considerable military potential in the event that civil war erupted once more, especially if they were to more formally ally with one another and coordinate their activities, potentially under Suu Kyi’s stewardship. The above map presents the clearest way for one to understand the present status of forces in Myanmar, and it was drawn from the NCA information listed at the beginning of the analysis. 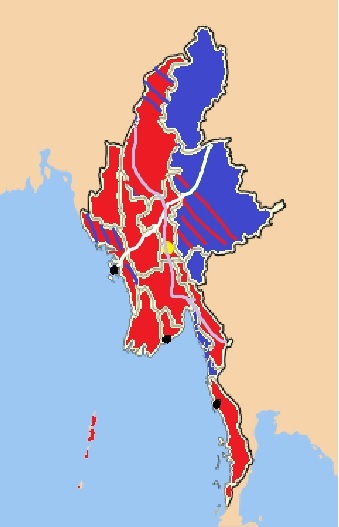 The government has control over a strategic corridor stretching from the northwest to the southeast, with the lynchpins being Chin State (the one just north of blue-striped Rakhine State [“Rohingyaland”]) and Kayin State (the elongated province directly south of the three blue ones), both of which are marked red due to their primary rebel groups’ participation in the NCA. The result is that Naypyidaw controls enough territory so as to secure the newly operational India-Thailand Highway that’s expected to become a major economic artery for its future growth, and the vast majority of the country’s population (and thus, laborers) falls under its jurisdiction. 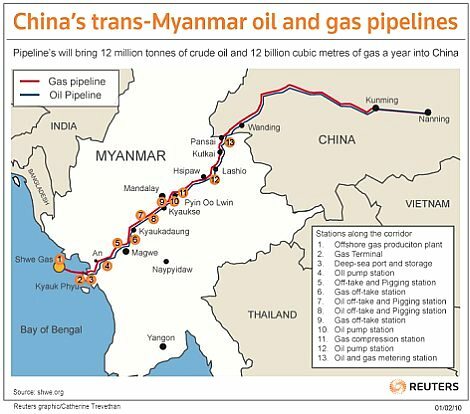 Furthermore, two of the country’s SEZs are also safely under its control as well, meaning that Myanmar could realistically maintain the astronomical growth rates that have made it the fourth-fastest growing economy, with or without regaining full sovereignty over the rebel periphery. The pro-federalization rebels not party to the NCA are concentrated mostly in the northeast Kachin and Shan States along the Chinese border, and some reports argue that a few of the groups might be under the influence of China. Whether or not this is true is a cause for considerable debate, as China stands to lose a lot more than it gains by indefinitely prolonging a state of instability along its borders, especially since its geostrategic oil and gas pipelines pass through rebel territory. Furthermore, as witnessed at the beginning of the year during the Kokang Rebellion (led by the Myanmar National Democratic Alliance Army, not a member of the NCA), stray shells fell into Chinese territory, creating an international scandal for which the Myanmar military later had to apologize and admit responsibility. It’s these types of chaotic situations that China definitely doesn’t want along its southern border, especially as the US seeks to exploit any and all available opportunities (and well as create its own) so as to offset Beijing’s influence in Greater Southeast Asia (of which its Myanmar-bordering Yunnan Province is geographically a part of). Reverting back to a more domestic analysis about the non-government-controlled areas, they’re short on population but rich in natural resources, and therein lay the reason behind their federalization aspirations. They believe that they can acquire formidable wealth if their tiny native population didn’t have to share their resources’ riches with the rest of the country, siphoned out by the central government’s scattered military outposts throughout their territory. Suu Kyi appeals to them precisely because she wants to decentralize the country and move towards a federal model, which is the only thing that these diverse ethnic fighting groups have in common (if it’s not outright independence). As explained in the above section about the government-administered territory, the central authorities don’t have to go on the offensive in order to survive, but also, because of the rebel’s natural resource wealth, they, too, don’t really have to change the status quo in order to prosper, aside from ridding their territories of the military that still ‘steals’ their resources (as they see it, which is the cyclical source of the conflict) or politically realizing a federalist solution that empowers their region. This means that the rebels are technically on the losing defensive, but the dense jungle terrain and hilly geography are on their side and thus poses a massive hindrance to all government efforts in projecting influence deeper into the area and changing the current balance of power present in the periphery. The color of the stripe represents which ‘bloc’ is making progress in establishing its influence over a given territory (or part thereof). As can be seen from the map, there are three areas that could possibly become contested battlegrounds in any forthcoming resumption of civil war. Beginning with the northerly most, the blue stripes in Sagaing State represent the National Socialist Council of Nagaland – Khaplang (NSCN-K) that was touched upon earlier. They may not control that much of the area by themselves, but together with their Kachin brothers-in-arms, that part of the state definitely falls under the control of the rebels. It’s an enormous vulnerability from the government’s point of view because the NSCN-K is the leading organization in the United Liberation Front of West South East Asia (UNFLW), a terrorist umbrella of separatist groups active in Northeast India that proved threatening enough to New Delhi for it to enact a cross-border raid against them in June. Moving along, the next striped section is colored red and lies in the western part of Shan State, home to a plethora of active rebel movements. It’s shaded due to the Shan State Army – South’s participation in the NCA and the government’s scattered military presence in the area, which thus allows the newly created capital to acquire a certain degree of strategic depth from any rebel attack. Keep in mind that the military does in fact have influence further than is indicated on the map (recall the Kokang incident spoken about earlier along the Chinese border), but because of the unfamiliarity its majority-Burmese troops have with the far-flung terrain and the dissipated nature of rebel encampments throughout, it’s almost impossible for it to assert a level of sovereignty there equal to what it does in the heartland. The nature of Myanmar’s civil war is that it’s very difficult to draw clear-cut frontlines between forces, but the red shading in the map was estimated as the best approximation of where the government can exert the highest degree of relative control in the state. Finally, the last shaded region is the entirety of Rakhine State, otherwise known the homeland of the Rohingyas and referred by them as “Arakan”. The two main rebel groups associated with the area are on opposing sides now, with the Arakan Liberation Party (ALP) signing the NCA while the Arakan Army (AA) has yet to do so. Interestingly, however, neither group is thought to exert much direct influence in the state at all, with the AA currently being based in Kachin State, the nucleus of the country’s rebel movements, while the ALP is in the extreme northern reaches of their home state but also in Kayin State. The blue shading is explained by the fact that AA has infiltrated some of its troopsback into Rakhine State, meaning that it could very well be preparing an insurgency there among the disgruntled Rohingyas in order to jumpstart the creation of a South Asian “Kosovo” for “Rohingyaland”. If they go forward with this plan, and especially if it’s coordinated with a concurrent rebel offensive in the northeast countryside and a Color Revolution in the urban areas, then it could possibly succeed, hence why the government felt compelled to get on the good side of one of the rebel factions so as to divide the demographic in the event of any uprising. Speaking of which, the population could be provoked towards this end in the event of nationalist Buddhist attacks against the Muslim minority in the state, which have in fact happened before but have yet to lead to an insurgency.